Here are the updated ratings for Terra Nova. On this new TV series, humanity’s last chance for survival is to travel back in time and try to colonize pre-historic Earth. The first season of Terra Nova typically airs Monday nights at 10pm on the FOX network. Here are the TV show’s ratings for the 2011-12 season, the best way to tell if Terra Nova is going to be cancelled or renewed for season two. Check out our FOX ratings report card to see how this show’s numbers compare with the others on the network. UPDATE: Terra Nova has been cancelled so there won’t be a second season (at least on FOX anyway). Final first season average: 2.5 rating in the 18-49 demographic with 7.52 million total viewers. 2.2 in the demo (0% episode-to-episode change) with 7.18 million; third place at 9pm, tied for second at 9:30pm. Season average: 2.49 in the demo with 7.52 million. Demo average rank: #8 of 13 scripted TV shows on the network (Fall 2011 – Spring 2012). 2.2 in the demo (+5% episode-to-episode change) with 7.18 million; second in the timeslot. Season average: 2.51 in the demo with 7.55 million. 2.1 in the demo (-5% episode-to-episode change) with 6.88 million; third in the timeslot. Season average: 2.55 in the demo with 7.67 million. Demo average rank: #7 of 13 scripted TV shows on the network (Fall 2011 – Spring 2012). 2.2 in the demo (+5% week-to-week change) with 7.2 million; third in the timeslot. Season average: 2.59 in the demo with 7.75 million. Demo average rank: #7 of 12 scripted TV shows on the network (Fall 2011 – Spring 2012). 2.1 in the demo (-9% week-to-week change) with 6.50 million; third in the timeslot. Season average: 2.63 in the demo with 7.81 million. 2.3 in the demo (-11% week-to-week change) with 7.01 million; third in the timeslot. Season average: 2.70 in the demo with 7.98 million. 2.6 in the demo (+24% week-to-week change) with 7.75 million; third in the timeslot. Season average: 2.76 in the demo with 8.12 million. 2.1 in the demo (-25% week-to-week change) with 6.59 million; second in the timeslot. Season average: 2.78 in the demo with 8.18 million. 2.8 in the demo (+12% week-to-week change) with 8.31 million; third in the timeslot. Season average: 2.9 in the demo with 8.5 million. Demo average rank: #6 of 11 scripted TV shows on the network (Fall 2011 – Spring 2012); tied with American Dad and The Cleveland Show. 2.5 in the demo (-19% week-to-week change) with 7.0 million; second in the timeslot (delayed until 9pm). Season average: 3.0 in the demo with 8.54 million. Demo average rank: #6 of 10 scripted TV shows on the network (Fall 2011 – Spring 2012). 3.1 in the demo (0% week-to-week change) with 8.73 million; tied for second in the timeslot. Season average: 3.1 in the demo with 9.06 million. Demo average rank: #4 of 10 scripted TV shows on the network (Fall 2011 – Spring 2012). The two hour premiere attracted a 3.1 rating in the all-important 18-49 demographic and 9.22 million. It was in third place for the timeslots and surely a disappointment for FOX considering the production expenses and promotion. On the positive side, the two hours showed very good retention which means that most people who tuned in kept watching until the end. That’s a positive indicator for next week. When you compare this with last season’s 8pm premiere of House, the network was down by 24% in the demo. On the positive side, Terra Nova improved over last year’s quickly-cancelled Lone Star premiere by 238%. What do you think? 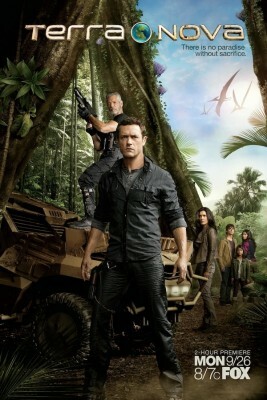 Do you like the Terra Nova TV series? Do you think it should be cancelled or renewed for a second season? Its a crying shame to see so many of these GOOD tv series start up run for a season or two then be dropped. Terra Nova was one of the BETTER tv series on fox. Would be nice to see it back again even at this late a date. Most of what’s on TV nowadays are stupid reality shows. The reality is that we need more like Terra Nova. Unbelievable! I liked the show so much, I recorded everything else I watch and viewed 3 or 4 episodes at a time. I have cable, and if I wanted all the good channels, I would have to sell my house and live in a cardboard box to pay for them. Just for the record, I do not watch any reality shows !! Nothing REAL about them !??? It is so sad that they cancel something like this show but can keep shows going like hunney boo boo or sixteen and pregnant. There needs to be a new way to come about making these shows. you guys have too bring this show back this waas a a really goood family show , cause there is a very few that the whole family can wacth together please bring this amazing show thank you…….. I can’t get over it ! Terra Nova is really a fantastic show, I want a new season ! Come back Terra Nova !